Greg and Ernie Schimizzi are likeable, unassuming, regular guys, whose low-key style often conceals the passion, vision and ingenuity that has made Hamptons TV into a major success. My first meeting with them was when Ingrid Lemme, host of The American Dreams Show interviewed me. I was immediately impressed with their warm manner and good humor, which made every guest feel at ease. We met later for dinner and had a lively, entertaining and funny conversation over our meal. Theirs is the story of how two brothers from Brooklyn went on to create the largest, most-watched TV station in the Hamptons and whose audience has expanded worldwide. From early childhood, the Schimizzi brothers were exposed to the magic of television by their father, Joseph, who was a general supervisor of Waljohn Plastics in Brooklyn. He would frequently take the boys into Manhattan to visit the NBC production facilities in Rockerfeller Center. In the 1950’s Dave Garroway, the original host of The Today Show, would broadcast live from ground floor studios, open to the public. Greg and Ernie came way from the experience amazed and impressed that they could stroll onto a set and watch television in production. TV made a lasting impression on the Schimizzi brothers, which would later give an inspired connection to their father’s memory when he passed away unexpectedly at age 46. Their early TV idols in the 1950’s were icons of entertainment: Uncle Miltie, Ernie Kovacs, Steve Allen and Jackie Gleason. Today, this era is known as Television’s Golden Age. Greg and Ernie came away from these early experiences realizing that TV was not just a magical medium; it was an ever-evolving art form. Keeping their promise to make their seamstress mother proud, they would go on to earn advanced degrees at New York University and later be named NYU’s Television Family. In 1977, Greg resigned as a psychologist at the Veterans Administration to join Ernie to form a television production and distribution company called Video Voice, Inc. They went on to produce more than 150 motion pictures and formed an exclusive partnership with MacMillan Publishing Co. and the Canadian Broadcasting Corporation. They also entered the literary world with their scholarly book, “September 11, 1776 America’s First Attempt at Peace” which described a peace conference held on Staten Island during the early stages of the Revolutionary War that could have ended the conflict, but instead solidified the path that formed the burgeoning country. While in college, the brothers invented an “Anti-Theft” trunk lock device for automobiles and filed it without legal assistance, receiving U.S. Patent in 1971. According to the Patent examiner who reviewed their filing this was an amazing accomplishment because less than one half of one percent of all patents filed without legal assistance were granted. The device was put into production by Chrylser and the royalties help fund the brothers’ future ventures. 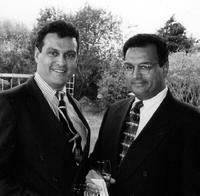 In 1994, Greg and Ernie founded WVVH-TV, Hamptons Television, a TV station as special as the area it serves. They operate from a studio located near the East Hampton Airport, and began a 24-hour operation in September of that year. WVVH-TV became the last FCC license for all of Long Island, broadcasting on Channel 50 and on East End Cablevision Channel 78 and throughout the tri-state area on Verison FiOS Channel 14. Hamptons Television is an eclectic mix of quality family programming, News and Sports, but its real niche is the signature programming of local events. It is also the official TV station for the Hampton Classic Horse Show, Hamptons International Film Festival, Sandcastle Contest, FOLIO Awards, Guild Hall Events and James Beard Foundation Chefs & Champagne. The Schimizzis are also the executive producers of the well-regarded and highly visible “The American Dreams Show” with host Ingrid Lemme. The show is produced on location before a live studio audience at Gurney’s Inn in Montauk. According to Ernie, the brothers have always tried to be innovative in the careers, which has led them to focus on the burgeoning internet as an alternative mode to attract viewers worldwide, in 2004, the brothers’ latest innovation help bring live streaming TV broadcasting to the internet at WVVH-TV. Today, anyone in any part of the world with access to a computer and the internet can receive WVVH-TV immediately. The brothers recognize the potential of the worldwide web and capitalized on it. 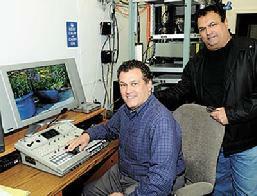 When others in the industry failed at maintaining a round-the-clock broadcasting channel, the Schimizzi Brothers succeeded. The achievement is truly extraordinary and exclusive to Hamptons TV. Last year, 5 million viewers log on to watch. Their latest endeavor is expanding the station’s carriage on Time Warner cable into New York City and Verizon’s new FiOS TV service. Greg and Ernie have been acclaimed as “Pioneers in the World of Broadcast TV” by the NY Friar’s Club. The Schimizzi Brothers have found a way to combine their educational background, entrepreneurial skills, and concern for humanity into an ever-growing media entity. Their Wainscott Studio is open to the public as a reminder of their childhood dream that became a reality. Stay tune for more from these guys from Brooklyn.